2018 has already started, but that doesn’t mean it’s too late to tweak your list of New Year’s Resolutions. While you’re busy trying to figure out if that gym membership is really worth it and how you’re going to get the promotion at work that you’ve been waiting for, why not set your sights on something a little simpler? Making the effort to improve your oral health this year can boost your confidence, save you money on dental work down the road, and maybe even protect your overall health as well. Here are a few simple things that your dentist in Danville recommends you do in order to give your teeth and gums the TLC they deserve. Cleanings remove tartar, which you can’t get rid of with a normal toothbrush. Exams catch problems like gum disease and cavities before they become major issues. You can get personalized tips and product recommendations that will help you keep your teeth in the best shape possible. Developing a relationship with your dentist will make you feel more comfortable in that big chair. Floss once a day. Flossing removes plaque from the tight spaces between teeth that your toothbrush can’t get to. Be mindful about sipping water after meals. Water encourages saliva production and helps to rinse away food particles and acid that would otherwise be sitting on your teeth and attacking them. Chew gum after you eat. Sure, some people might think it’s rude to chew gum, but this habit is great for your oral health. Just like sipping water, it encourages saliva production and helps keep your mouth nice and clean. Consider using a mouth rinse. Some mouth rinses just fight odor-causing bacteria, whereas others are geared specifically to whiten teeth, prevent tartar formation, or fight gum disease. Depending on your oral health needs, a rinse might be just what you need for a healthier smile. We’re not saying you have to stop eating all the treats you love, but you should try to make wise choices when you’re selecting your foods and drinks. Remember that acids and sugars are anathema to teeth, so try to cut back on things like soda, candy, coffee, and fruit juice. A diet that is full of veggies and calcium-rich foods is one that will help your teeth stay strong and healthy. May your 2018 be a year of brilliant, healthy smiles! The team of dentists at Danville Dental Associates is passionate about promoting healthy teeth. 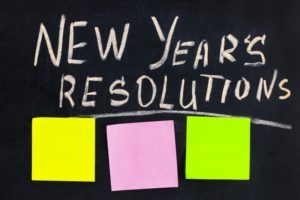 We’d love to help you keep your New Year’s Resolution for improved oral health. Feel free to contact us so we can chat about the needs of your smile.